Go: Straight up. The only hold used from Scratching Post is the small sloper initially used for the left hand on that problem. Here it becomes a right hand hold. Avoid the good hold higher up onScratching Post. 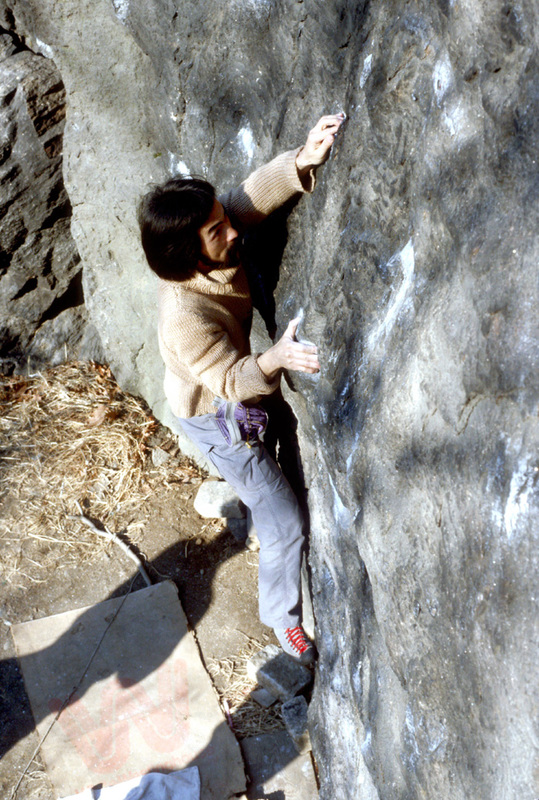 When first climbed, the crux involved sticking an almost non-existant sloped hold. This move was extremely height-related: too tall or too short made the move much harder. 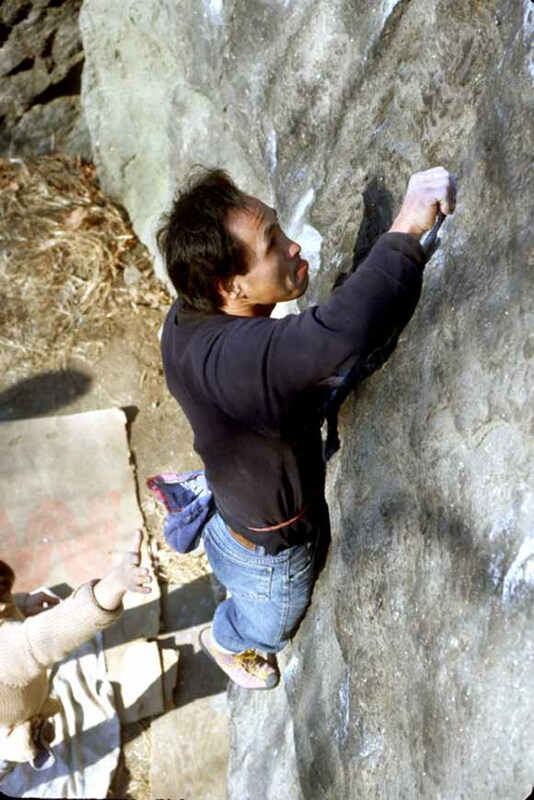 Later, a key hold for the left hand broke after the third ascent. It was later climbed with an entirely new (and harder) sequence. Start: In the middle of steep main face. Right hand high on an obvious undercling hold, the left on a shallow, thin horizontal crimper. Go: Straight up with a difficult move to get established into the undercling. Continue up past tiny crimper to a shallow, thin crack/slot. Fire for the top and mantle. This long-anticpated route proved to be not quite as hard as some thought it would be. A difficult sequence to unravel none-the-less. 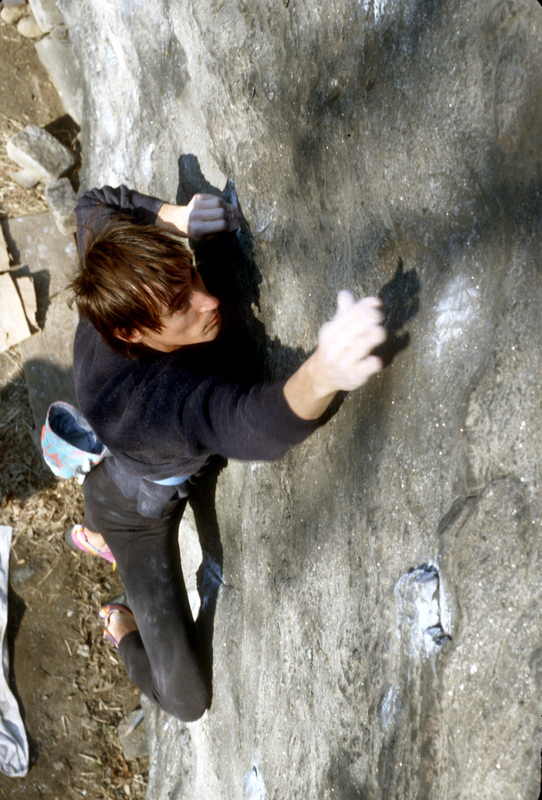 Sought after for years, the first known ascent went to a visiting climber on his first day at Cat Rock. Until the development of Worthless Boulder, it was widely considered the best boulder problem in the city. Start: On the left side of the main face where there is a small depression at knee-level. An obvious pinch/sidepull for the right hand and a tiny, dished out crimper for the left. Go: Either move halfway up Fancy Feast and then right one step, or (a much nicer beginning) angle up and diagonal slightly right from the opening move of Fancy Feast past two hard-to-hold irregular crimps. Continue to the same shallow crack/slot hold found on Private Angel (for the right hand on this problem) and make a big move for the top. Mantle. Though not quite as aesthetic and extreme as Private Angel, it is a classic face climb requiring significant finger strength and excellent fotwork. Originally created as a variation to Fancy Feast, the version of this problem as worked out by Komba and Yuki (diagonally up right from the start) is truly a route that stands on its own. Variation: Kitty Litter V6 After getting established on the upper crimps, traverse right across Private Angel and Elias. Exit via the notch. Start: Same as The Dawg. Go: Straight up, finding small edges and avoiding the large, sloped hold out left. The precursor to The Dawg, it opened the way for the other routes on the main face. Still a fun route with a hard start and a finish that seems much harder than it is if you ignore your feet. Start: Immediately left of Fancy Feast. Two thin vertical seams are found below a large, sloped hold. 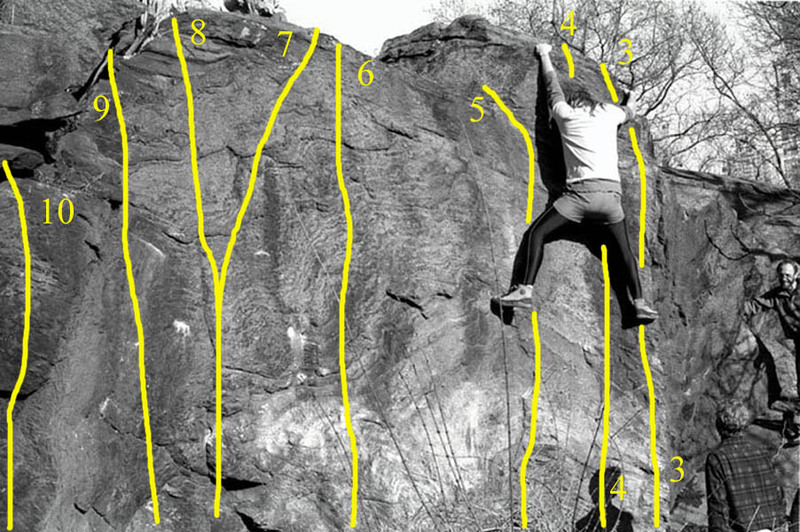 Go: Up to the large, sloped hold and the finish. Start: On the broken, irregular arete at the west end of the main Cat Rock block. Start: Left of Obtuse Arete, on east-facing wall with an obvious vertical seam. Go: Climb crack and face to top. Start: On overhanging lip 6-8 feet right of Cat Corner. Go: Hand traveres the lip to Cat Corner. Move around the arete and continue hand traversing the top lip to Felix. Yuki makes the opening move of The Dawg. Komba on the tiny crimps of Private Angel.